Whether your party's sneaking into a massive creature's lair to steal a legendary treasure or mounting an assault on a giant tribe's fortress, no Game Master wants to spend time drawing every oversized bed and ominously large stewpot. Fortunately, with Paizo's latest Pathfinder Flip-Mat, you don't have to! This line of gaming maps provides ready-to-use fantasy set pieces for the busy Game Master. From an ancient, abandoned giant manor to a titan's war council, this double-sided map makes the perfect setting for any foray into the realms of the giants! Don't waste your time sketching when you could be playing. 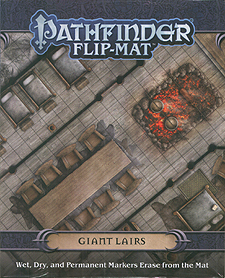 With Pathfinder Flip-Mat: Giant Lairs, you'll be prepared next time your party's ready to challenge giant foes!